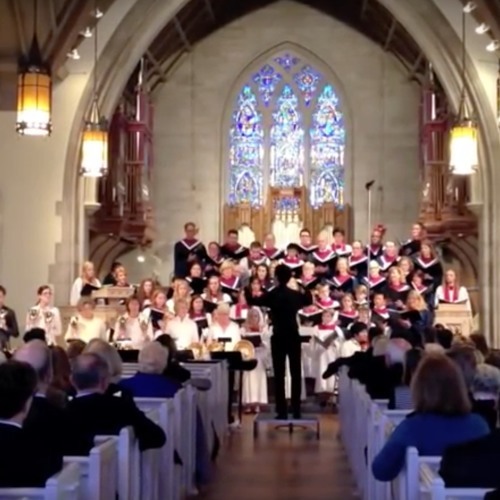 “Sing to the Lord” by Hunter Chang is a celebratory liturgical piece. It was originally orchestrated for a large ensemble including choir, brass, strings, percussion, and piano. The choral part was composed for a combined youth and adult ensemble, demonstrating the way music expands beyond itself from the youngest children to full grown adults. The piece is a majestic celebration of the excitement and power of music in the church. It is majestic and expansive due to the diversity in instruments and coral voice, and is therefore capable of vastly different energies including intensity in dynamics, rhythm and harmony. The piece has moments featuring and celebrating aspects of text as well as the energy and intensity of the percussive instruments. This is demonstrated in climactic moments of a capella hymn followed by orchestral and brass homophonic harmonic progressions. The piece traces simple themes throughout a hymnal type form. It starts with an instrumental introduction building to a point of climax with an immediate drop in instrumentation, dynamics, and tempo. This sudden drop highlights the ability of the orchestra to start in a dramatic chordal opening to a suddenly choral section. The piece then builds to the introduction of the central theme lyrically and musically, where the choir sings in octaves “Sing to the Lord.” This is a reoccurring theme that acts a grounding point for the piece. Although the harmonic orchestration changes underneath, the choir sings the theme in unison. This creates variety harmony tied together through a melodic unity.